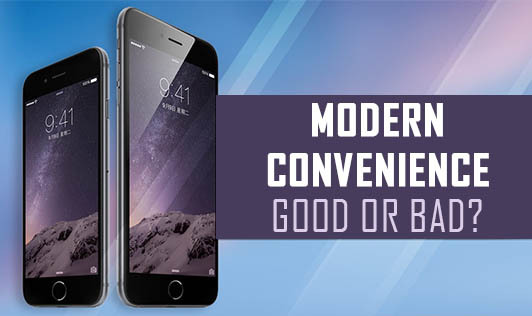 Modern Conveniences- Good or Bad? Over the last years, there have been remarkable changes to our ways of life. Many of the products that we use today have made our lives much more convenient and effective; however we fail to understand the consequences it has on our health and the environment. • Cell phones: In recent years, theories suggest that low levels of electro-magnetic fields (EMF) from cell phones and cell towers lead to health hazards. Recent research suggests that cell phones may lead to higher risk of brain tumours, miscarriage and birth defects. EMFs are also said to influence a body hormone called Melatonin which protects our immune system and acts as a powerful antioxidant. • Plastics: Plastic products have been associated with adverse health conditions such as ulcers, eye irritation, cancer, ulcers, infertility and impairment of the immune system. Hence, it is highly recommended that people should opt for alternatives whenever possible. • Amalgams: This is commonly known as silver fillings. Amalgams are used as a cavity remedy and contains mercury. There are debates concerning their effects on health as well as long-term well being. Mercury is a known toxin to many organs of the body and research has shown that very high levels of mercury can cause chronic illnesses such as dementia and heart disease. In fact, the FDA has given their consent to alert certain risk groups like pregnant women and children to minimize the use of mercury fillings for safety. • Teflon cookware: Many people use Teflon cookware because of their non-sticky component for a clean and pleasurable cooking experience. But, what they are unaware of is that the synthetic coating can cause serious health issues such as birth defects. This product has been regarded as a carcinogen and has no biodegrading properties. • Styrofoam: This would definitely make a great cup for holding a hot cup of tea, if it were not the chemicals in Styrofoam that could pose health risks. Styrene is a chemical that has been found in nearly all the individuals who were tested after using a Styrofoam cups. Hence, a better option would always be to use your own coffee cup whenever you can. • Microwaves: A very convenient and easy way to prepare and re-heat food today is with a microwave. As good as it sounds, there has been speculation regarding the usage of microwaves. There have been reports that microwaves reduce bioavailability of nutrients like Vitamin B complex, E and C, essential minerals and nucleoproteins. Hence, it is advisable to use microwaves for short durations and only when it is absolutely necessary. Is it so essential to be fast paced at everything, that we must compromise on our health in the process? Definitely not! It’s time to find alternatives that will not hinder our health and well-being!